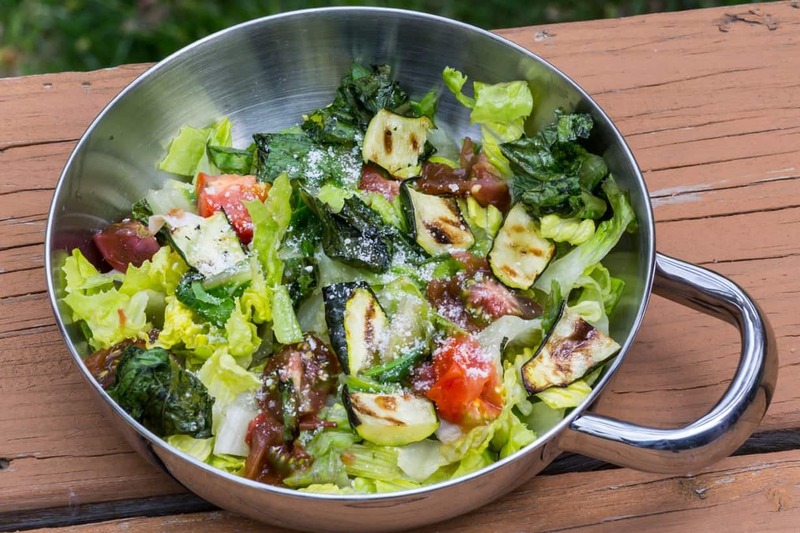 Salads are a perfect side dish standby for camping. They are healthy, easy to make and they compliment a lot of other camping standard main dishes like grilled meats. Since a lot of camping happens in summer months, there’s no shortage of fresh in-season vegetables to choose from and a refreshing salad provides a nice energy boost after a long day of outdoor fun. Finding a go-to salad recipe for camping can be a good idea. But if you’re like me, many of your salads don’t really follow a recipe, they just come together based on what looks good at the grocery store or farmer’s market, or what you have sitting in your crisper drawer. In this Grilled Vegetable Salad recipe , I take some salad standards for a short stint on the grill for a special, smoky side dish. What I like about this recipe is that it makes salad a little special without getting too complicated. The last thing I want to be doing at the campsite is chopping 12 kinds of vegetables and mixing together a 16 ingredient dressing when I could be having fun or eating my delicious meal. This salad is simply prepared, and simply dressed. If you don’t want to fuss with making the dressing (which really isn’t much of a fuss at all), feel free to use your favorite bottled dressing. Paul Newman’s Olive Oil and Vinegar is a favorite of mine, with the added bonus of it not needing to be refrigerated. This recipe is very flexible, feel free to experiment by adding in or substituting with other grill-able veggies. I think artichoke hearts and red peppers would be nice additions. One note: the first time I made this salad, I grilled the cherry tomatoes. I didn’t really care for them that way. I love tomatoes, but when I grilled them, it really changed their flavor, making them sweeter, too sweet for me. Grilling also (of course) changed the texture of the tomatoes, making them too mushy for my taste. Grilled vegetables add a smoky twist to a side salad. Slice the cherry tomatoes in half, sprinkle with salt, set aside. Trim the ends off of the zucchini, slice in half vertically, then slice each half vertically to end up with 4 wedges. Brush the romaine and zucchini wedges with 1 TBS of olive oil. Sprinkle with salt. Place the romaine and zucchini on the grill over medium coals. Grill the romaine for 3 to 4 minutes on each side. Grill the zucchini 4 minutes on each of the wedge's three sides. Remove the vegetables from the grill. When cool enough to handle, chop the romaine and place in a large bowl. Slice the zucchini wedges into bite sized pieces and add to the bowl along with the cherry tomatoes. Whisk together the 2 TBS of olive oil, the red wine vinegar, salt, pepper and cayenne. Drizzle over the vegetables along with a sprinkle of salt and pepper and toss.